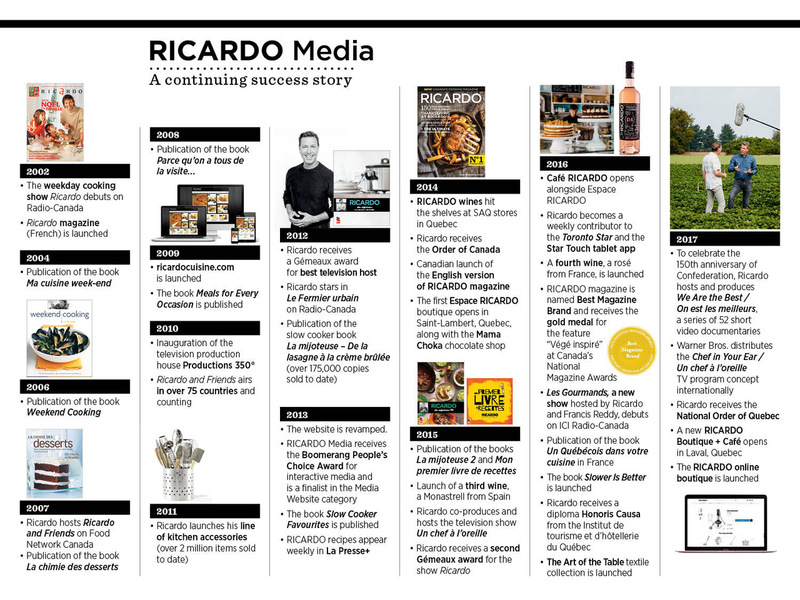 Chef, author, TV personality, entrepreneur… Ricardo is a man of many talents. As a celebrity chef who has become a household name nationwide, he represents a brand that embodies a modern vision of the art of family living. And his mission is to promote the importance of cooking and eating together. After training in Montreal at the Institut de tourisme et d’hôtellerie du Québec (ITHQ), Ricardo studied radio and television broadcasting in Ottawa which led him to a job with the CBC based in Regina. When he returned to Montreal he met his future wife (and co-founder and president of RICARDO Media), Brigitte Coutu, a young dietician who was working as a researcher on a local TVA show. Soon enough they began working together to develop simple recipes for various television shows—Brigitte working behind the scenes and Ricardo in front of the camera. In 2001 he joined the popular Quebec television program Les Saisons de Clodine as a co-host and became a regular columnist with the newspaper La Presse. People started to recognize him on the street. It wasn’t long before Brigitte and Ricardo were approached and offered the opportunity to create their own television show and magazine—focusing on their particular brand of recipes: simple, affordable and using ingredients that can be found at the corner store. 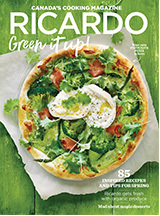 In 2002, the first French-language Ricardo magazine was launched and the rest is, as they say, history. Ricardo is also a weekly columnist for Montreal’s La Presse newspaper and the Toronto Star, as well as Montreal radio stations Rythme FM and CJAD. He has also been named a member of the Order of Canada as well as the Ordre national du Québec for his efforts in making cooking accessible to all, and for his commitment to various social causes. In 2017, he received an honorary degree from the Institut de tourisme et d’hôtellerie du Québec for his career achievements. In june 2018, Ricardo and his wife, Brigitte have also received this honour for their contribution to food and nutrition in Quebec. Passionate about helping others, for the last 12 years Ricardo has been a spokesperson for La Tablée des Chefs, an organization whose goal is to feed families in need and provide cooking skills and culinary education for the next generation. In recognition of his commitment and dedication to youth, he has also received the Queen Elizabeth II Diamond Jubilee Medal. And on a deeply personal level, after Brigitte was diagnosed with breast cancer in 2006, Ricardo also supports various causes devoted to fighting breast cancer. Along with architect Pierre Thibault and tri-athlete Pierre Lavoie, he is one of the founding members of Lab-École, a non-profit organization dedicated to building a multidisciplinary team of experts who will reimagine the environment of tomorrow’s schools. RICARDO Media was selected as part of the Canada 150 Signature Initiative Projects to inspire pride across the country in 2017 to produce WE ARE THE BEST, a series of 52 videos exploring Canada’s culinary richness. Hi Christine! Please forward your questions to commentaires@ricardocuisine.com and it will be our pleasure to answer them for you. saw the round bread video but can't find recipe, nor the video. Help! I am missing something as my bread didn't rise. Where can I find the printed recipe. Merci. In my house you are known as "The Kitchen God" and my 3 grown grandsons are becoming excellent cooks via your magazine and programs.....Thanks so much!!! In my house, you are known as "The Kitchen God"
You have a magazine? Where can I find it in Ontario?..in the Richmond Hill area? Ricardo, my husband and I enjoyed your cooking show on the foodnetwork years ago. Miss you! However, I bought your 1st edition magazine 2 months ago and loved it! Informative, creative and great layout filled with lovely photos. I went on to get your latest edition and made the candy cane bark last night with my girls. Easy to follow recipe! Yummy too! A subscription to your magazine is my birthday present from my 3 children. My husband says "Ricardo" is welcome into our home anytime! Much success & love!! Thanks for your kind words, we appreciate it! I am excited to see your magazine in English; I have been tempted to buy it in French but my knowledge just wasn't there. I watched your program on TV and thoroughly enjoyed them. I made your chocolate chip cookies from your magazine for my grandchildren. They were great even my husband loved them. Keep up your good work. I am so happy to find you Ricardo. I miss your cooking show on English TV. Your trips to visit the producers of food in Quebec was always a heartwarming experience. Please come on English TV again soon. They need another Canadian show with great production values I think it is called. I call it good taste in background, utensils, etc. I just made your classic chili and that is how I found you. Best ever chili. I love you Ricardo. Doris. Thank you for your good words. We now have an English magazine! For more details, you can click here.